Spring Cleaning? We Take ALL Textiles! Twice a year I do a closet purge. I used to respectively sort out the better quality stuff that could be reused and donate it separately. All my other textile waste (used underwear, stray socks, shoes with holes in them) went to the trash. I thought I was ‘doing it right’ and believed putting torn up or stained textiles in the donation bins was rude and gross. Clearly I had no idea, and I cringe at the thought of everything I needlessly sent to landfills over the years. I am not alone. The average Canadian throws 7kg of textiles that could be recycled, into trash that ends up in local landfills. This isn’t just bad for the environment, but hurts our economy as well. According to this Toronto Star article, if our recycling rate jumped from 25% to 50% it would create 5,000 direct jobs & 17,750 indirect jobs for Ontario alone. Many people are under the impression that if they donate a pair of jeans, the jeans are then donated to someone in need around the corner. Although at times this happens, textile recycling is far more dynamic in its approach to fundraising for charities. TWD Inc. collects clothing on behalf of Canadian Community Support Foundation and others that have bins all across Ontario and Quebec. 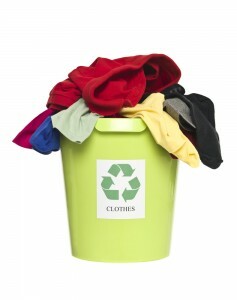 This clothing is collected in trucks and is brought to grading facilities that sort textiles by type and quality. Textiles that are damaged beyond repair get sold to recyclers that sanitize and shred fibres down, and reinvent them into things like cleaning rags and upholstery stuffing. Nothing goes to waste in the textile recycling industry. When we can, we take back good quality winter clothing that we donate to local area residents in need. Clothing that is still wearable is shipped to countries around the world that lack in domestic clothing supply infrastructure. Much of the used clothing we would consider unwearable, is treasured, especially by developing nations that cannot afford quality used clothing. I have heard many say that they wish for their donations to be distributed locally. This isn’t always possible, as there may not be a demand locally for that type of donation. However, by selling the clothing overseas, the funds raised are then given to local charities here through CCSF. So even if your jeans do end up in Africa, its still benefiting people in need in Canada. The grading facilities we deliver to supply these countries with affordable good quality clothing that they otherwise would not have access to. Countries like Africa, Bangladesh, and India all benefit from the textile waste diversion industry as do Canadian charities like CCSF. This is truly an industry where everybody wins, globally and locally. Spring is a great time to do a textile purge! We accept: Clothes, Purses, Belts, Linens, Shoes, Boots, Drapes & Reading Glasses regardless of the condition.